Game Show that originally aired in 1940 as an NBC Radio program with its creator, Ralph Edwards, as host. A decade later, it moved to television, first on CBS from 1950-54, then back to NBC from 1954-65. The show also had three runs on syndication: one from 1966-75 and two short-lived ones in 1977-78 and 1987. Contestants on the show were asked silly trick questions which they almost invariably failed to answer correctly. If they answered incorrectly, or failed to come up with any answer in a short time, Beulah the Buzzer went off. The host then told them that since they had failed to tell the truth, they would have to pay the consequences. Consequences consisted of elaborate stunts, some done in the studio and others done outside, some completed on that week's episode and others taking a week or more and requiring the contestant to return when the stunt was completed. Some of the stunts were funny, but more often they were also embarrassing, and occasionally they were sentimental (as when long-separated relatives were reunited within the context of the stunt). The show was popular enough that the town of Hot Springs, New Mexico renamed itself after the show in 1950 as part of a publicity stunt. 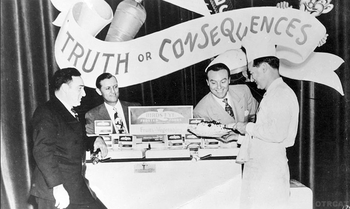 Truth or Consequences was one the first game shows to be broadcast on television, with an experimental broadcast on WNBT's first day on July 1, 1941. The show returned to the small screen as a prime-time series in 1950 with Edwards as host before being replaced by Jack Bailey in 1954 upon return to NBC. The prime-time series ended in September 1956, then was relaunched as a daytime series in December with Bob Barker as host. Another prime-time version aired simultaneously with the daytime version on NBC from December 1957 to June 1958 with Steve Dunne as host. Barker stayed on for the rest of the NBC run and for the entire 1966-75 syndicated run. Bob Hilton hosted the second syndicated run and comic Larry Anderson hosted the third one. The 1950 Looney Tunes short The Ducksters parodies this show (as "Truth or AAAAAAAAAHHH!!! "), with Daffy Duck and Porky Pig as the sadistic host and hapless contestant respectively. Game Show Appearance: Superman appeared on the radio version (Bud Collyer was the show's announcer). Game Show Host: Ralph Edwards hosted the original radio version and the CBS run of the TV show. Jack Bailey, of Queen for a Day infamy, replaced him when the show returned to NBC in 1954 until Bob Barker came along in 1956. Barker, Bob Hilton and Larry Anderson hosted the syndicated versions and Steve Dunne hosted the 1957-58 nighttime version. Progressive Jackpot: The probable originator with the "Mrs. Hush" contest. See Trivia page for further details. Broadcast Live: The television show was one of the earliest aversions. In 1950, it was the first program performed before a live audience to be prerecorded on 35mm film, beating I Love Lucy to the punch by a year. Starting in 1957, in another first, the show broadcast in all time zones from a prerecorded videotape instead of just using the technology for time-delayed West Coast broadcasts. Candid Camera Prank: The show would often do these, particularly during the Barker years. Conveyor Belt of Doom: One episode had a woman from the audience trying to stop an incredibly complex machine before its conveyor belt dropped a pie on her husband's face. There were all kinds of lights, switches, etc. on the machine which she flipped frantically, but unbeknownst to her, the only way to stop it was to pull the electrical plug out of its outlet. Luck-Based Mission: Barker's Box, which would be played with an audience member at the end of the show. The box had four drawers; three with money and one with a "surprise" pop-up. If the contestant managed to pick all three money drawers without picking the "surprise" one, they would win a bonus prize. Pie in the Face: One of the "hidden camera" pranks involved three couples who were filmed while waiting "backstage". A producer gave them their release contracts. The men's contracts were the boilerplate ones, but the ladies' contracts had an additional paragraph stating that the first one to pie her husband would receive $100, the second one $50 and the third one $25. Hilarity ensued. Signing-Off Catchphrase: Bob Barker would sign off with "Bob Barker saying goodbye, and hoping all your consequences are happy ones!" Years later, on the November 11, 1994 episode of The Price Is Right, he accidentally began signing off with that phrase, but caught his mistake and ended up with "Bob Barker saying goodbye, and hoping all your... prices are right!" Unwinnable Joke Game: The joke questions were deliberately set up to be unanswerable so that the contestants would end up having to "pay the consequences", the big draw of the show. They were either nonsensical questions about made-up facts, legit questions with obscure answers, a joke set-up or a common riddle or general knowledge question, but they were always impossible to answer correctly within the ridiculously short time limit. In the very rare cases where the contestant manages to answer correctly, the host would just give another question. Urban Legend: During a Saturday Night Live retrospective, cast member Garrett Morris claimed that he saw an episode of Truth Or Consequences where an elderly white woman played a racist song on the piano at the end of the show — she got as far as "I'm gonna get me a gun and shoot all the n***ers I see" before the show abruptly cut to black. Morris then proceeded to play a parody of that song, replacing the offending word with "whities". note In reality, that incident almost certainly didn't happen because the show was prerecorded, which would give plenty of time for the censors to cut out potentially offensive material before it can go on the air. Wham Line: In hindsight, anyway. Ralph Edwards: Remember this name, you'll be hearing a lot about him. Ladies and gentlemen, Mr. Bob Barker!